Hey all! Roger's tournament is underway and it couldn't have started much better for him as he cruised through with a routine 6-2, 6-4, 6-1 victory over young Frenchman Benoit Paire. I expected Roger to be pretty rusty after he chose to play no warm up tournaments but to be honest he looked to be on form from the outset. Paire offered little resistance either so rust or no rust there was only going to be one winner. Federer was able to break in the first game, save 2 break points in the next and take the first set comfortably. Paire will have been nervous prior to the match and then to get broken first game plus waste break points back will have shaken him mentally. French players tend to be very mentally weak so to be honest there was probably no way back for him after that even though it happened so early on. The second set started a little brighter for Paire as he served 2 aces on the trot to hold and take the first game; once again though Roger kept his level just above the Frenchman's and broke for a 2-1 lead and then held to love before serving out the set 6-3. Cruise control. Federer broke to open the third and by this point Paire was completely done. He actually played like a mug after that; choosing to put in stupid hawkeye challenges, attempting ridiculous between the legs shots and trying to hit everything at 100mph. I thought it was kinda daft really but I guess he had to at least try something different, even though it looked more half hearted than anything meaningful. Roger of course took it in his stride and was all business just applying more and more pressure. Paire finally held at 4-1 and actually had a break point of his own but couldn't convert and Roger closed out the match to comfortably move into the second round where he'll meet Nikolay Davydenko who beat Dudi Sela in 4 sets. It's tough. I don't know what to do against him,” the Frenchman said. “I don't know (how to handle) his serving or his returning. For me, I can do nothing. Paire is world number 46 and supposedly one of the brightest prospects on tour but to say he has no clue just shows how far ahead the guys in top 4 and even top 10 to an extent really are compared to everyone else. I started with the early break, and then saved a few break points, and then had the lead ever since. So obviously when you're in the lead, you feel better, you feel less pressure, you try a few things to see if those works and then you have options up your sleeve. I'm obviously very happy with this first round match, so total control. He can be a tricky opponent, you know, but I guess his playing style doesn't disturb me that much overall. I'm happy I was able to play a clean match out there today. Overall I thought this was a pretty perfect start from Roger. Paire didn't play well but I don't think a test is really what's needed just yet, they need to come in the later rounds or just before the start of the second week. Fed served well, hit some good ground strokes and never really looked trouble so it's hard to say if there's anything he needs to specifically improve on. Perhaps the best thing he can do is just keep progressing through the rounds, conserve his energy and hopefully bring his A-Game when it counts. There's been no upsets in the draw as of yet as both Djokovic and Murray had similar matches to this one, both winning in straight sets. None of the top seeds have fallen and everyone I expected to win has done so far. Tomic made it through comfortably too and he plays Daniel Brands who beat Martin Klizan. I think Brands will put up more of a fight than Klizan would have done so it could be interesting. I expect Tomic to win though and he'll most likely face Roger; but that's not a guarantee just yet so we'll wait and see. Next up for Roger is Davydenko, these two last met in Rotterdam last February where Roger prevailed in 3 sets before going on to take the title. It was one of my favourite matches of last year as it epitomised Roger 3.0 and to an extent was the match that got his 2012 season rolling after his defeat to Nadal in Australia. Roger leads the H2H 17-2 and it's been a very one sided rivarly to be quite honest. Davydenko won both of his matches in the space of 2 months back in 2009/10 but Roger has won the last 5 meetings making him clear favourite. Davydenko troubled him back in 2010 in Melbourne where he was a set and a break to the good but I can't see it happening this time. He might be on a bit of a mini resurgence making the final in Doha again but he always plays well there and I think Roger knows his game too well to slip up here. There might be a close set in there but I see Roger crossing the line in straight sets again 7-5 6-2 6-4. Allez! I had a very close match with him in Rotterdam last year. I should have won in two; ended up being 4-4, 0-40 in the third. I was very close to losing. Next thing you know, nobody talks about it. I went on to win the tournament and nobody talks about Nikolay. Over to you, did you enjoy Fed's first match on Rod Laver and what are your prediction for the Davydenko match? That Tomic sure has an ego! I hope he wins so Fed can put him in his place! I predict 7-5 6-4 6-4 for Fed next round… Similar to yours. I think Koala will put up a fight but will never have the upper hand. 1/7 steps done! Yeah Davydenko will muster some resistance early I think. Depends how early and how well he can strike the ball. If Roger wins a few of the long rallies and mixes it up then he usually implodes and never gets back mentally. Didn’t know about that stat! Another record. GOAT. Interesting stat! I wonder who holds the record for most wins on Clay. Thanks, Paul! Those were some interesting stats. So, Nadal, with his 36 titles, doesn’t even have 300 wins? Which means Nadal is nothing but a Clay court bully (statistically). I mean, he get the most out of those tournaments. Yet again, he rests, so he can be back for the Clay stretch. Everything seemed to be working well for him today. He played as well as he had to, but still put on a good performance which is encouraging. The main thing is for him to just keep progressing through the rounds with as little fuss as possible, and as you said, to try and conserve energy. I think that Davydenko will be a tough test but I still expect Roger to come through that one without any major drama. I’m looking forward to seeing how the Tomic match plays out, if he gets to play Roger in the third round. I would be very amused if he lost to Brands after the comments he made about playing Roger before the tournament. But focus on the second round first. One match at a time! Yeah was nice to see him start well. Paire was a bit of a pushover though but Fed got the job done with ease. Kolya will have to play his best tennis to beat him I think and he’s not managed that since 2009 so unlikely. I think the Tomic match will happen. It will be closer than last year I’m sure but we’ll see. Roger looks very, very good in this match and beautiful to for watching in early morning! 🙂 I hope that he will continue in the same or a better rhythm below. I think that he can win the title! The last match with Djokovic was a clear sign, just little things decided that match. Perhaps now is the time for revenge?! I hope so! Let’s go Roger!!! Yeah, too early for me! 3.30am start. Argh. I think he has a good chance. And nobody is talking up his chances so it’s good. Amazing atmosphere in the whole arena! Still remember that awesome running backhand passing shot Roger hit in the first few games of the match! Everyone in the crowd went crazy! And there were some sweet backhand crosscourt winners as well. Good thing Roger picked the blue polo for the match as well, I think the grey is probably for the night matches. Awesome! Looked good on television so imagine it was even better on Rod Laver arena itself. Looked warm though! Yeah, the rallies on TV actually look slower than they are than watching from the arena. I sat in the shade area, so the sun wasn’t a problem for me! Today I went to work after my vacation. But of course I watched Roger when he began to play. In Holland the match was just before 5 o’clock. And when I left for work (in Holland today it snowed a lot) I got to see the matchpoint. Roger won in some 1,5 hours. He is so nice. Waited for me with his matchpoint !! Just kidding. One complaint (from a girls point of view): I did not like his shorts !!! Those are Rafa/Novak/Andy shorts. I like his white short with one horizontal stripe on the back with the same colour of his shirt. Todays shorts were not that great. Oh yes, Davydenko will be tough, but Roger will win. Hope he doesn’t get to bothered by the heat. Ah good timing for you then! Starts an hour earlier for me, hard to wake up! Weren’t the shorts just standard Fed shorts? Hi Jonathan and Serajul. I am looking forward to the Davy match. I know Roger can take the heat, but tomorrow it will be some 40 degrees??? That is tough, no matter how much you practised. Still Roger will win, but it will not be easy. It might even be four sets. but I will keep my eyes on the result. I did not see the Novak match, but considering the result and Wilander saying that he played perfectly………………. is going to be tough for Roger. I do have to make this comment. After winning Novak said in his interview something like that he played flawless and that he was happy that he did that at the second round. Can you believe how many people would have said that Roger was arrogant if he was the one who said this??? Bleacher Report AGAIN had an article about it beeing a trend that Roger goes into QF and SF but never beyond (they did have one sentence about the exception him winning Wimby). And AGAIN no article about the possibility that Novak or Andy could lose too. It is really all about Roger losing. Just for these reporters/commentators/critics it would be so fair and justice if Roger won AO. Katyani, it’s an evening match for Roger. Will it still be 40c? I doubt. Tomic just slugged out a tough one in the heat. A match he should’ve lost, but won by picking up a couple of key points. These scribes make me sick. Scribes do what they are supposed to do best: Act like panderers. They go with whoever is the man of the moment. Did I say they make me sick? Paire totally tanked at the start of the third set. He did not impress me one bit. Yeah he clowned up in final set. Not sure if he was just wanting it all to end or just thought he’d try something different. Looked daft. Yeah it was a great start! I still can do the star rating thing, just forgotten to add it recently. I’ll try do it on the next one. Roger came to the net i think 25 times, winning 18 of them? /So it’s obvious he’s trying to conserve energy and because he was in the lead could try some things out here and there. This match was hyped up so much but as always routine win. Davydenko will be a much more serious encounter however Federer was in better form than i thought, so as you say, hopefully straights sets again in the heat, where the ball does in fact travel faster. Judging by Tomic’s easy win last night, I’d say they will meet, maybe he will get pushed a little bit by brands though, we will have see though. 1 down, ,6 to go. Allez Roger! Yeah that challenge was daft. Kinda just showed he was out of it mentally, couldn’t even make simple decisions. Night match vs. Denko so will be slightly cooler although the sun doesn’t set till 8.45 in Melbourne so gonna be quite warm still I guess. Brands is an unknown quantity to me really but he did beat Monfils in the Doha Quarter finals 2 weeks ago. That’s a good performance so he might be in form. He seems to be quite aggressive so if Tomic starts playing passive he might catch him out. Did anyone of you feel the courts are playing faster? Sure, it’s hot in the day and playing in the cooler evening is different, but what do you think? Jonathan, I loved your comment, “French players tend to be mentally weak” 😀 French players are quite hot headed to being with. Influenced by the neighboring conquistadors? Imagine what the Melbourne heat could do to them! I think they looked a little quicker but it’s hard to say. We’ll find out in the later rounds I guess but Gilbert and Cahill both said they are playing quicker. True about French guys though, always seem to crack mentally. But I’m glad he won. Hi Sid, Ryan Harrison after yesterday’s match said in the press conference that the courts are playing faster than last year. Hopefully that should help Fed. The fact that all of Fed’s first serve in the last match (barring the sliders) hovered around 200 km mark should be a testimony to that. The serve speed is off the racquet; it wouldn’t matter what the courts speed was. Jiten, you’re right, I did feel the ball was zinging, even in the third set. And the courts will actually become slightly more faster as they are played on. Addarsh, agree and disagree with you. Serve speed is off the racquet, sure, but the court texture helps in a big way. Would you say serving at the exact same speed, Roger would be equally effective on the grass at Wimbledon and the horribly slow clay of Paris? Addarash is right though, serve speed on the speed gun isn’t anything to do with court speed as it’s measured off the racket. So you can’t use that as indicator. The only thing that matters is the speed it reaches the opponent at, and if the courts are playing quicker i.e. there’s less friction when the ball meets the surface then that’s the news we want to hear as it makes not only the Federer serve more effective but his ground strokes too. Yeah, but he specifically referred to the speed being 200km/h, which is a measurement from the racquet. Great to see Roger so sharp from day1! 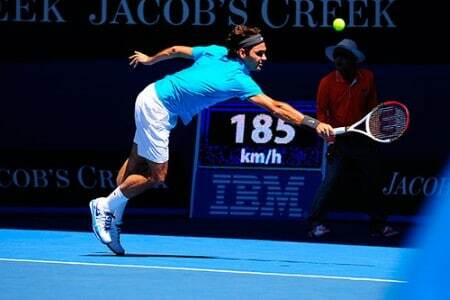 Incredible racket swing speed…service motions, too, looked faster that ever…is that only my imagination? Beautiful to watch. Ha ha, you never know what’s in French people’s mind. Thanks for the prompt match report and looking forward to the next one. He looked in good form that’s for sure! I’m trying not to get too carried away as it’s only the first round though. Weird how they all seem to mentally weak though, it’s like a definite trait. Someone needs to investigate! The courts do look a little faster – Djokovic was rifling his forehand tonight. You think? I thought they looked slow… Then again, I might be badly remembering last year, but I found they were missing some zip during fed’s match with Paire… Maybe he’s not got his pace up yet? Or maybe I just cant see well enough…? I thought they looked reasonably quick. The only time we will see is when Fed plays someone who is good at defending like Murray or Djokovic. If he can hit through their defences then the courts have gotta be a little quicker. Watched a set and a half from the Tomic match. The courts do seem a tad faster. Maybe. I can’t really compare with last year. I wish the final was played in the day. The cooler evening air means advantage to people like Murray, Djokovic and Nadal. I know, that extra hour makes all the difference! Haha unlucky Sid. I had 3.30am for the Paire match whereas you had like 9pm so swings and roundabouts! Yeah he made Harrison look amateur. But still early, he made mince meat of guys at Wimbledon too in the early rounds. Just looking at the stats now. Too solid from Djoker. Harrison didn’t play a bad match if you look at stats, Djokovic just too solid on the return. Harrison not got any weapons though, bit of a clown tactically too so expected I guess. I’d say Harrison’s serve would count as a weapon, though yeah, it and other aspects of his games were destroyed in that match. Hopefully he does the same against Davydenko tonight/tomorrow/today depending where you are! Great vid! Saw someone tweet it last week, definitely one worth checking out. The 3D version isn’t bad either but should’ve been in better quality. Looked great with anaglyph glasses. Good stuff as ever Jonathan. Fed is looking rested and relaxed. I think that he is going to slide in under the radar and take this thing. As usual it’s on his racquet. If he can keep his unforced errors down, and keep his serve percentages up, he’s got a great chance. The courts are playing faster it looks like. If his stamina is good he can last after Murray. I think that Fed is in better shape than Djokovic. It’s never talked about but I think Novak has Asthma. He has gotten control over it in the last few years with his new diet, but he still seems to me to breathe with an open mouth a lot in the latter stages of matches. Fed usually doesn’t even sweat. I don’t think I’ve ever seen anybody in as good condition as he is. I guess I won’t be getting to bed early for awhile.! Yeah still early days but I think he has a chance. It was a good start to say he hasn’t played since November competitively. I kinda think Djokovic is over his breathing difficulty days now. I mean look how he won last year in Australia beating Murray and Nadal in back to back 5 setters that were brutal physically. He’s a machine these days. And if Fed + Djoker meet it rarely gets to stupid physical levels. Roger has to keep the points short whatever happens so never going to be a battle of the fittest it’ll be Roger trying to dictate and Novak looking to defend and play offensive when he gets the chance. Anyway, 5 more matches before we talk about a Djokerer final. Hey Jonathan.. I think i read in one of ur previous post regarding Verdasco. He always seem to play his best here in melbourne. Even though i havent seen his play this year. He is quietly going through the rounds. I too believe he might be a slight dark horse. Who else do u think is playing well? I know its just been the first early rounds, but sometimes u can generally feel who will potentially go deep in the tournament. Regarding the match up with Davydenko, i forsee a Federer win. But it will good for Federer to play someone that challenges him a bit. But this will good mental and physical preparation for the later rounds. Yeah I thought Verdasco might do well this tournament. He’s pretty unreliable though. I’ve not seen his matches, he went 5 against Goffin though in first round but beat Malisse in straights today which is a good win. Probably make the 4th round. Did you ever see the semi final of 2009 between him and Nadal? That’s how dangerous he can be. One of the best matches of recent times. Shame he never kicked on after that as he looked like he could be a slam contender. Not sure on who else playing well, the usual suspects; Djoker is looking ominous but it’s still early days. 3rd/4th round you can usually get a feel for who is in form. Berdych steady so far. Also Bennetteau creeping through. Nishikori too if he’s fully fit could be dangerous. Shame he’s kinda physically tiny though, no weapons. Yes I like Verdasco too – have a soft spot for him – but sadly his talent has not been maximised since his epic semi loss to Nadal in AO 2009. Regarding Berdych, I hope he gets off his backside should he meet Djokovic in their expected quarter final encounter and improves on his appalling 1-10 head-to head with Djokovic. He has upset both Nadal and Federer in the past and now needs to do the same against Djokovic. If not, I fear the latter will sail into the final. Regarding Roger, I have a strong feeling he will make the final but should he do so, it all depends how he and Djokovic get there. If Roger is not played into the ground before the final and taking his extra day’s rest before final ( as his semi is the day before Djokovic’s ) then he has a good chance to win. Just one small word of warning though: Roger has not lost before the quarters in a slam since the French Open in 2004! and this record will end someday. The fact he has by far and away the toughest quarter of the Top 4 means he must be exceptionally vigilant and should he reach the final he can let loose against Djokovic! Well Fiasco is out, he lost to Anderson today in another 5 setter! Berdych is cruising so far so maybe he will get a set off Djoker but I can’t see anything more. Djoker matches up with him too well. Hi… Yes the Verdasco match in 09 against Nadal was awesome, i thought he was going to beat him. But still an highly entertaining match! Regarding the other players in this years Auss open u r probably right will have to wait for the later rounds to kick in. Again thanks for reply!! Yeah it’s one of my all time fave matches really. Non Fed ones anyway! Fiasco lost today though against AnderCHOKE. 5 setter, good win for the South African. Didn’t Verdasco get beaten by Tomic last year in the first round? Yeah he did, he’s crazy is Verdasco. Would win slams if he could focus. Djokovic, Murray, Tsonga, Berdych, Verdasco, Almagro, and Ferrer are all playing well right now.